Yep: the lights of the 9/11 memorial, as seen through the screen of a smartphone. (Put another way: the lights of the 9/11 memorial, being blocked by the screen of a smartphone.) With the smartphone in question, ostensibly, connected to a wireless network like AT&T's. Buzzfeed sums up the whole thing nicely: The image is, it says, "without a doubt the tackiest 9/11 memorial on the Internet." Though I'd suspect you could, if you looked, find a tackier one -- and though AT&T's effort was much more tasteful than, say, this -- point taken. The Internet may have enabled a new, more interactive, and in some ways more fluid relationship between product-seller and product-consumer than could ever have existed before; it may have opened up more platforms for brands to relate to their customers one-on-one, and to, in the process, express some of their common humanity. None of that means, however, that people want brands to have a place in their rituals of public mourning. And it certainly doesn't mean that people want their remembrance to come with a side of product placement. There are ways, to be sure, for brands to engage with a 9/11 and its anniversary. The smart, ones, however, find ways to do that that purposely avoid involving the products they sell. (See: Macy's, NASCAR, even Chick-fil-A.) 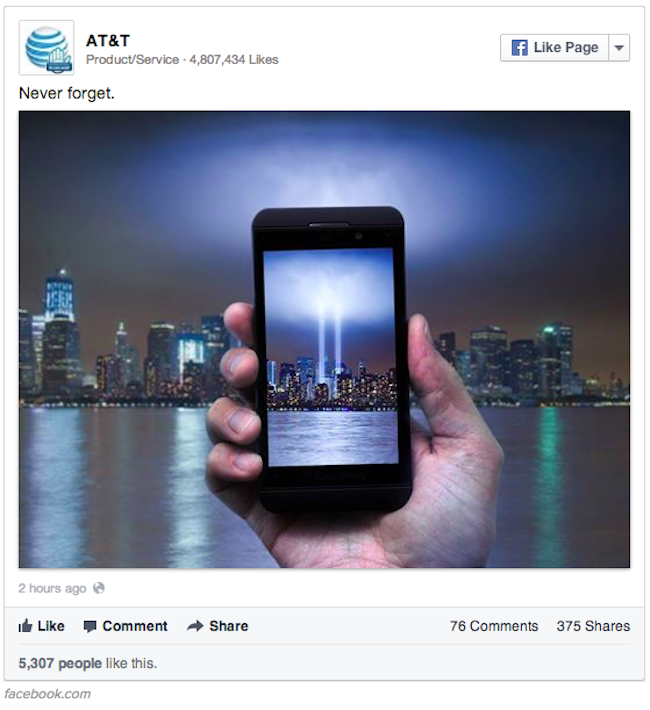 AT&T, on the other hand, has released unto the world an especially unfortunate strain of product placement: the advermemorial -- or, if you will, the advermorial. The particular kind of advertisement that aims to take a national tragedy ... and brand it.